The RSL Virtual War Memorial welcomes Professor Robert O’Neill AO as its Military History Ambassador. Robert O’Neill AO FASSA FAIIA has worked in the fields of international relations, history of war and strategic studies since 1961. He was Head of the Strategic and Defence Studies Centre at the ANU, Canberra, 1971-82, Director of the International Institute for Strategic Studies (IISS), London, 1982-87, and Chichele Professor of the History of War, All Souls College, Oxford, 1987-2001. He served in the Australian Army 1955-68, graduating from the RMC Duntroon in 1958. After studying for his Doctorate at Oxford as a Rhodes Scholar, he was mentioned in dispatches for his service with 5 RAR in Vietnam, 1966-67. He was Chairman of the Council of the IISS 1996-2001 and of the Trustees of the Imperial War Museum, 1997-2001. He was a member of the Commonwealth War Graves Commission, 1990-2001. He was elected a Fellow of the AIIA in 2008. He wrote the official history of Australia’s role in the Korean War (2 vols.). He was awarded an honorary D Litt by the ANU in 2001. We are greatly honoured that Professor O’Neill accepted the invitation to be an Ambassador for the RSL Virtual War Memorial. We are equally honoured that he has provided an excerpt from his publication Vietnam Task: The 5th Battalion, the Royal Australian Regiment to mark a most significant anniversary – 24 May 1966. It can also be viewed on the 5th Battalion Royal Australian Regiment Association website. 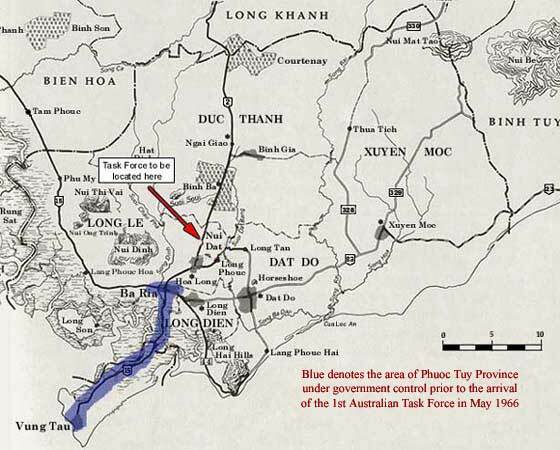 The Fifth Battalion, RAR, had the honour of being the first Australian unit to carve out a secure base in the Viet Cong dominated province of Phuoc Tuy, beginning in May 1966. It was a risky undertaking: the province was dominated by some 2,000 Viet Cong troops, based in the northern sector, who could be reinforced by a further 2,000 from adjacent provinces. The Viet Cong knew the terrain well and had their own sources of supply ready to hand. 5 RAR had some 800 men, and could call on heavy fire support from the Americans. For the first few days of the operation, two US Airborne battalions were in the province. But once on the ground by themselves in central Phuoc Tuy, the Australians had to be careful. A costly engagement in the early stages of the commitment could have been fatal to the whole Australian undertaking there. On May 17th the two battalions of the U.S. 173rd Brigade, the 1st/503rd and the 2nd/503rd flew into the Nui Dat area to commence a sweep of the surrounding countryside. The 1st/503rd Battalion was accompanied by Captains Peter Isaacs and Brian Ledan. A few days later they reported back to Vung Tau with news of the operation. The Americans had encountered several groups of Viet Cong of company size and it was apparent that there was at least one enemy battalion in the area of Nui Dat, assisted by some companies of guerrillas. One of the American companies had been badly mauled on the first day of the operation. At 3:30pm on May 17th, B Company of the 1st/503rd was moving up the western slope of hill 72, one and a half miles north of Nui Dat. 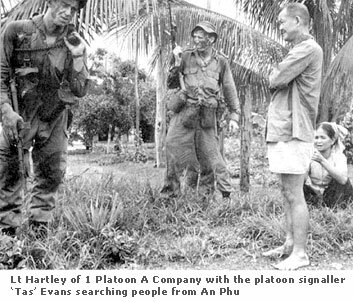 They knew that they were being followed by a Viet Cong rifleman carrying a radio, but they did not know that in their path was a Viet Cong company who were being guided by the man with the radio. The Americans were caught in the deadly cross fire of a box ambush to which were quickly added 60mm. mortar bombs. By the time that they had extricated themselves they had lost eight killed and twenty three wounded -- a heavy blow for an infantry company to sustain. While the American sweep was continuing, the battalion’s CO Colonel Warr was finalising his plans. The tasks of the Fifth Battalion in Operation Hardihood were first to clear the area to the north and east of Nui Dat to a distance of five thousand metres so the enemy mortar fire could not reach the future base area, and second, to establish a defensive position to give security to the Nui Dat area while the other units of the Task Force concentrated in the new base. Therefore, the first part of the operation entailed a sweep over a quadrant shaped piece of country with a radius of about three miles. It was possible that Viet Cong forces up to regimental size were in the area and therefore the battalion had to be sufficiently concentrated to allow the companies to reinforce each other within an hour or two. The area of operation was divided into several sections so that all four companies could search simultaneously. They were planned to be at least several hundred yards apart to avoid the risk of two companies clashingly unwittingly. The thickness of the vegetation limited visibility to twenty yards in many places and to make half a mile in an hour was pretty good progress. Each of the company areas was given natural boundaries, such as tracks or streams, rather than arbitrary lines drawn on a map so that the searching patrols could see clearly when they had reached the limit of their areas and the commencement of the territory in which the next company would be operating. The area to be searched was divided so that D Company moved to the southern area around Nui Dat, C Company went to the central area a mile north of Nui Dat, and A and B Companies covered the northern edge of the area. The morning of May 24th was dull and misty. Reveille was very early as the companies began taking off in helicopters shortly after dawn, in approximately half company groups. My lift took off at 0936 hours, punctual to a few seconds. The helicopters seemed to be amazingly close together in the air. From a distance they looked like a long line of cherry stones hanging and bobbing on strings. From close up it was like driving on a motorway with a third dimension added to the movements of the vehicles around one. The country looked quiet and sleepy, clad in small wraps of white mist which clung around the tall trees. The landing area was a broad flat hilltop in front of a rubber plantation which formed the north-western extremity of the An Phu sector. Rubber trees ran along two sides and low scrub on the other two. This landing zone was code named Hudson. The name stuck after the operation and whenever we referred to that ground it was simply called Hudson. When we landed we saw a few members of the 2nd/503rd Battalion standing around, washing and smoking and looking very wet for the wet season was well under way. As we waited in the rubber for the companies in front to shake out and move off, we were deafened by the American artillery and mortars which were firing in support of an engagement taking place a mile and a half away. We moved off at about 1 p.m. just as a group of eleven Vietnamese were being escorted into battalion headquarters by members of A Company, who had been searching the houses of An Phu. We passed through the bananas, around the hamlet and crossed Route 2. The narrow strip of French bitumen looked a little forlorn in these wild surroundings. On the eastern side of the road we moved into scrub. The heat in the opening was punishing for no air stirred in the tall grass and one had the feeling of being stifled. We were saturated by perspiration in ten minutes so that our jungle green shirts looked black. After clearing nearly a mile of country we made camp near the crest of Hill 72 at 5 p.m. An hour later, Bruce sent out a water party to fill up our depleted water bottles from a creek some two hundred yards to the south-east. A Company had found a number of Viet Cong further away to our south-east during the afternoon and were following them up, so the water party, members of Five Platoon under Sgt Hassell, were treading warily. Shortly after reaching the stream and posting scouts around the water point the party were fired on. Everyone went to ground and the fire was returned. During a pause Private Errol Wayne Noack, one of the water party, stood up to move to another position. As soon as he rose up he was hit by a burst of sub-machine gun fire. Just then, A Company reached the stream from the other side and drove the Viet Cong off to the north. A stretcher was quickly assembled by Five Platoon, while Corporal Ron Nichols, the company medic, had dashed forward and dressed Noack's wound. It was my task to call battalion headquarters on the radio and request a medical evacuation helicopter. For some peculiar reason these helicopters were known as Dust Off helicopters - probably a code name which stuck because of its convenient length and unambiguous sound when spoken over a poor radio net. The next forty minutes were crowded with activity as we waited for the Dust Off. The defences of the company had to be sited properly and checked to see that each of the three platoons was linked in with each of the other two on its flanks. The siting of each of the ten machine guns had to be individually checked to see that the main approaches to the company position were covered by fire and that each gun was capable of giving mutual support to its neighbours by firing across their front in the event of the latter receiving a frontal assault. While I was doing this, Major Bruce McQualter, was arranging for A Company to pass through our position so that they could make camp to our north-west. A landing zone fifty yards across was cut for the Dust Off and Noack was carried to the edge of the clearing. He had been hit in the side and the back and the wound looked serious. Nichols had given him some morphine but he was still in pain and complained of a lack of feeling in his legs. Bruce spent several minutes talking with Noack and giving what comfort he could. We were very thankful to see the helicopter appear overhead just as darkness was gathering. The pilot saw our coloured smoke marker and confirmed the colour so that he knew he was not being lured to a killing ground by the Viet Cong. A huge African American medic jumped out of the aircraft when it landed. He looked jet black in the gathering gloom. His direct brusqueness seemed professional and reassuring. We returned to digging the defences before darkness became complete, keenly aware that we were close to the point at which the American company had been attacked and feeling rather uneasy, wondering what Viet Cong force might be gathering to pounce on our position whose location had been betrayed by the Dust Off helicopter. As events turned out we need have had no worries, but we were shaken by the realisation that death could come in this war without warning and without knowledge of the assailant's intentions or numbers. At 10 p.m. we received a call on the radio from battalion headquarters. Noack had died in the helicopter on the way to Vung Tau. The worst had happened and its acceptance was very difficult.